Two months ago, I telephoned the media team at News International. I wanted to know what they thought - as an employer - about the fact that one of their journalists had been run over by an HGV just outside their offices. That cyclist was a woman called Mary Bowers, a woman who is still in hospital and still in a coma. What the team at News International told me was that this was not the first time. Today The Times editorial bangs this message home very very forcefully. Incredibly, it has gone as far as making its cycling articles free online and you can review most of these from this link here and this link here. I have to cycle through either of these junctions to get to the centre of London every single day. They are horrible, nasty places and extremely dangerous for people on bikes and on foot. Boris Johnson has been challenged about them - and in particular about Elephant & Castle, the same junction that Nicole Cooke describes - in the London Assembly. What does Boris Johnson say? People who have cycled in London have been saying that Boris Johnson's 'cycling revolution' is just whitewash - some blue paint on some newly resurfaced roads and not much else. I can think of no better riposte than that made by Nicole Cooke. If it's too challenging for one of our Olympic cyclists, then I am proud to say, it's too challenging for me. And for my niece, my little cousins, my mum, most of my friends. In fact, it's too challenging for most Londoners. Boris Johnson is currently preventing Southwark Council from sorting out this junction and making it a safer place for everyone. Why? Because he thinks it is more important that 'traffic' flows smoothly through London's squares and high streets. What Johnson forgets is that we are all traffic. Bicycles, pedestrians and drivers. And that we want to 'be' in these places not just 'whizz through' them. Johnson is putting fast and efficient motoring ahead of every other transport policy. And I think that is wrong. And immoral. Southwark Council undertook some very detailed research recently. Sufficient numbers of Southwark residents would like to cycle - sufficient in fact for 47% of all road trips that start in the borough to be by bicycle. But they don't cycle. I think they don't cycle because the Mayor of London - Boris Johnson - is trying to convince them that cycling around places like the Elephant & Castle roundabout is a sensible thing to do. It isn't. And they're voting with their pedals. The Times is way more articulate on all these topics than I am. Have a read. And sign up to their manifesto. They are calling for an eight point plan and want politicians to wake up and act rather than spout the sorts of insane bumblings we are hearing from London's Mayor. 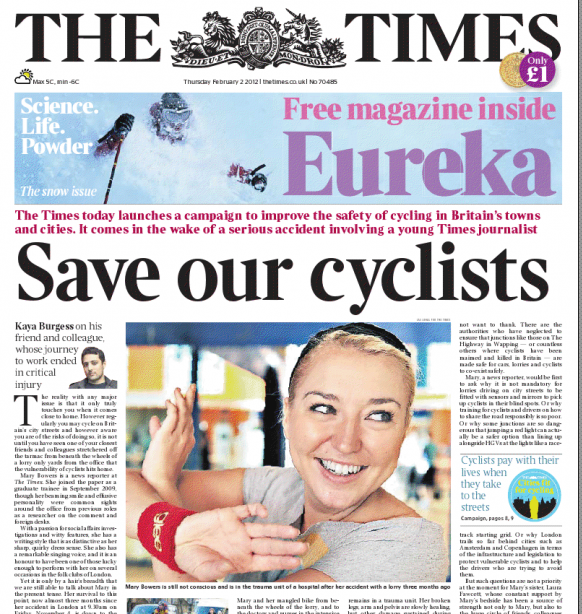 If you're outside London or if you're a Londoner, then push at a national level and get behind the 8-point plan that The Times wants politicians, councils and transport authorities to sign up to. You can very easily get around Elephant and Castle without having to use ANY of the roundabouts: there are cycle paths all the way around. The tfl journey planner can help you. Anyone who cycles on the roundabouts is asking for trouble. Why should cyclists avoid roads? Of course there are busy roads if we allow them to become fast, car dominated spaces. But we don't have to. They were not always like that. It's also not just roundabouts, but the main roads which TFL control. Last year, 9 of 16 died on the Mayors roads. the Elephant detour (besides only covering half the roundabout) adds significant time to a cycle journey through that area. Remember bikes are human-powered: cyclists don't choose longer routes because they're not efficient enough. In place like the Netherlands, it's motor traffic that takes the longer routes, while bikes are given safe, convenient, direct pathways. The problem with the cycle paths around E&C is that they go out of the way and are time consuming. Why should cyclists have to always give way? There is a strength in numbers around there these days, but it takes cajones to duke it out. Great news this morning on the radio about this campaign. I've been an occasional reader of your blog and thought there might be more about it on here. E&C roundabout is unpleasant and/or dangerous for everyone in my opinion - whether you are using it as a pedestrian, bus passenger or car driver - but I think as cyclists we get the best deal actually by being able to avoid it. Erm, it's worth pointing out that the eastern cycle bypass for E&C allows mixed mode travel by making you push your bike. I applaud The Times for this campaign. It is frustrating as an urban cyclist to see the poor provision for bikes while motor traffic runs riot. Cycling has the potential to make cities infinitely healthier and more liveable. 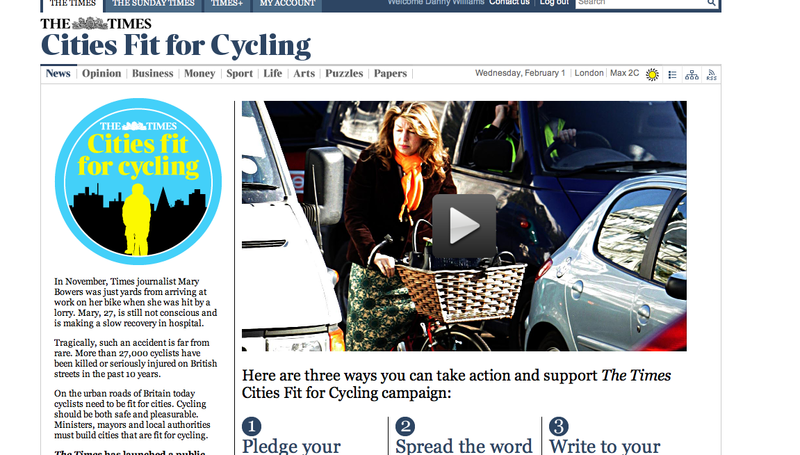 Let's hope this helps create a cycling revolution. It is about normalising cycling by adopting Dutch standards to our town planning. Definitely the way forward! Boris Johnson is right 'If you keep your wits about you, Elephant & Castle is perfectly negotiable'. But that's hardly a ringing endorsement. He's missing the really important point here; you should be able to cycle across a world class city without having to keep your wits about you. I am not clear is whether it's Boris Johnson that's holding us back or it's senior management in Transport for London who are still looking backwards and regard the ever growing number of cyclists just as a nuisance. Cities grow because they are great places for people to live and work. Not because they have got a good traffic smoothing policy.